At the handshake event of BNK48 fifth single 'BNK Festival' in BITEC Bangna was announced the title of BNK48's second album 'Jabaja'. Previously this group from Bangkok had released their first album titled 'RIVER'. Jabaja which will be the main song on BNK48's second album is an adaptation song from the AKB48 51st single with the same title and was released on March 14, 2018. On that occasion, BNK48 also announced a list of senbatsu members for Jabaja. They consist of 16 people namely Cherprang, Tarwaan, Jennis, Pupe, Noey, Jane, Namneung, Kaew, Orn, Mobile, Music, Pun, Kaimook, Bamboo, Fond, and Gygee. The first Senbatsu for the main song is Bamboo and Gygee. The center will be held by two people, Fond and Pupe who will also be the first center. BNK48 also announces pairs of songs that will be on Jabaja's second album. 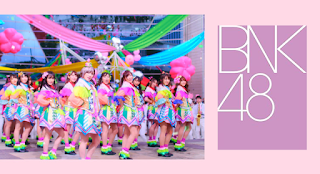 The second track song this time is a new song titled 'Reborn' which is an AKB48 adaptation song in the single Kibouteki Refrain and sung by Team Surprise. Senbatsu for Reborn was also announced, they were Miori, Jaa, Namsai, Izurina, Satchan, Jib, Korn, New, Natherine, Myyu, Mewnich, Pakwan, Nine, Juné, Minmin, Piam, Phukkhom, Faii, and Wee. The center position is held by Japanese member AKBR8 Izuta Rina. You need to know that Izurina is also the center of the Japanese version of Reborn's song. Nwzt Tracklist #03 บ๊ายบาย…นายพลาสติก (Kami7 Go Green) known as BNK48 original song sponsored by 7 Eleven Thailand. Track #04 there will be Kimi wa Melody (เธอคือ…เมโลดี้), #05 Tsugi no Season (ฤดูใหม่), #06 Yume e no Route (หมื่นเส้นทาง). Lagu ke-#07 BNK Festival, #08 Mata Anata no Koto wo Kangaeteta (คิดถึง…), #09 Temodemo no Namida (ถึงแม้จะมีน้ำตา), #10 Beginner, #11 Kimi no Koto ga Suki Dakara (ก็เพราะว่าชอบเธอ), #12 LET U GO dari OST. Where We Belong.